Rachel's Vineyard - What is Rachel's Vineyard? Married couples, mothers, fathers, grandparents and siblings of aborted children, as well as persons who have been involved in the abortion industry have come to Rachel's Vineyard in search of peace and inner healing. The weekend is a lot of work but yields a fruitful harvest for all who are willing to labor there. To learn more, please read about our weekend retreats. Also, please see comments from people who have attended the weekends, as well as our explanation of the name "Rachel's Vineyard." Theresa Karminski Burke, Ph. D., started one of the first therapeutic support groups for post-aborted women in 1986 after founding The Center for Post Abortion Healing. In 1994, Rachel's Vineyard: A Psychological and Spiritual Journey for Post Abortion Healing was first published. It was a unique support group model for counselors, offering a very concrete, emotional experience for women who were grieving the loss of their aborted children. In 1995, Theresa adapted and expanded the curriculum into a format for weekend retreats. Soon individuals seeking healing began to travel from other states to experience this very effective healing process. Without a budget, office or advertising, Rachel's Vineyard became a grassroots national outreach. By word of mouth only, the retreats began to spread across the country because of the retreat's dramatic effectiveness, from 18 retreats in 1999 and growing to 35 retreats in 2000. In 2003, Rachel’s Vineyard became a ministry of Priests for Life and its board was structured accordingly. Currently, Rachel's Vineyard has grown to over 1000 retreats annually, held in 49 states and 70 countries, with many new sites in development. Theresa Karminski Burke, Ph.D., has lectured and trained professionals nationally on the subject of Post Abortion Healing. Rachel's Vineyard Ministries offers an annual Leadership Training Conference specifically designed for those who currently use the Rachel's Vineyard program. She also trains retreat teams in the method and process. The Rachel's Vineyard healing models are used by mental health professionals, post abortion ministries, crisis pregnancy centers, pastoral care and faith based outreach programs. Each Rachel's Vineyard site is independently operated by a sponsoring organization. The Rachel's Vineyard weekend for healing after abortion is presently being offered by 375 sites across the world and in over 70 countries with more in development! Some Rachel's Vineyard retreats are hosted by church based ministries, counseling outreach programs, Project Rachel offices or Respect Life groups, and crisis pregnancy centers. It is offered in both Catholic and Interdenominational settings. Rachel's Vineyard also provides resources for those in post abortion ministry. 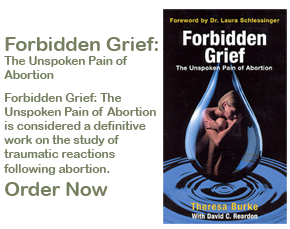 In addition to the Rachel's Vineyard weekend manuals and support group model, Theresa Burke, Ph.D., is the author of Forbidden Grief: The Unspoken Pain of Abortion, with David Reardon, the nation's leading post-abortion researcher. Forbidden Grief is an extensive study and analysis of the trauma experienced by thousands of women, men and couples she has helped after their abortions. What does the name Rachel's Vineyard mean? In Ramah is heard the sound of moaning, of bitter weeping! she refuses to be consoled because her children are no more. The sorrow you have shown shall have its reward, says the Lord. There is hope for your future! and I will remain united to you. it can do so only if it remains in the vine. In the same way, you cannot bear fruit unless you remain in me. will bear much fruit; for you can do nothing without me. Rachel's Vineyard takes this scripture to heart as the Weekend Retreat is a spiritual and emotional healing process. In trying to understand the mystery of death, we look to God in times of personal distress, trauma, and the loss of human life. after I had freed her from captivity. with chains of righteousness and justice, love and mercy. and you will really know me then as you never have before.